Twelve members of The Lutheran Church–Missouri Synod travel across the world to serve people in rural Kenya. Members of the LCMS Mercy Medical Team pray with their Kenyan medical colleagues before the start of the clinic June 21, 2016, in Nataparkakono, a village in Turkana, Kenya. Would you use two weeks of vacation to travel halfway around the world with total strangers to serve people you don’t know in an unfamiliar cultural setting? That’s exactly what 12 members of The Lutheran Church—Missouri Synod (LCMS) did in June, when they came together on a Mercy Medical Team (MMT) to Nataparkakono, a village near Lodwar, Kenya. Team members came from all around the United States and from all walks of life. There was a retired nurse from Iowa who brought her granddaughter, a recent high-school graduate. There was a recently married couple — a teacher and a medical student — from Illinois. There was a pastor from Texas, a doctor from Ohio and a city planner from Virginia. Most members of the team met for the first time at the airport, although they participated in a month-long email Bible study before departure. But it didn’t take long for them to form a strong bond, as they worked together for a common goal: to share the love of God by providing free medical care to underserved people. Since 2006, the LCMS has organized numerous MMTs that have provided desperately needed health care to more than 30,000 patients around the globe. 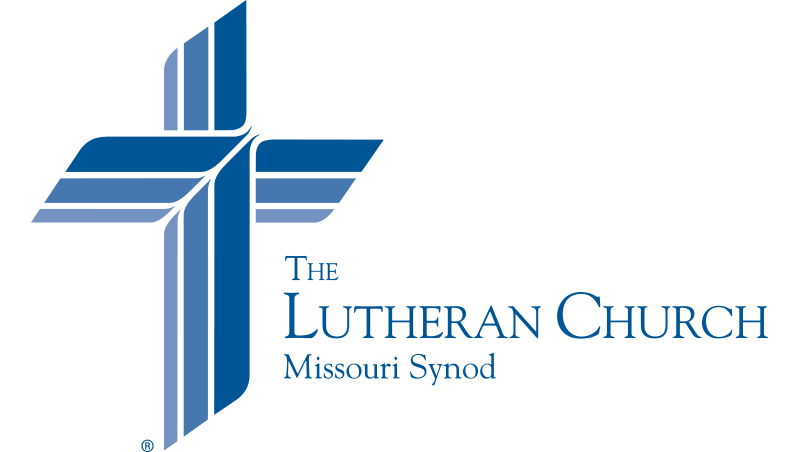 But MMTs provide much more than physical care; they also help local Lutherans bring the Gospel. Each morning, two land cruisers shuttled the team along barely discernible desert roads to the clinic site, where a crowd was already sitting under a straggly acacia tree. Some patients walked for miles to attend; others came from a nearby camp for people displaced by disaster or political or ethnic violence. The first stop for each patient was the evangelism tent, where volunteers from an Evangelical Lutheran Church in Kenya (ELCK) congregation in another town were waiting to help them register. 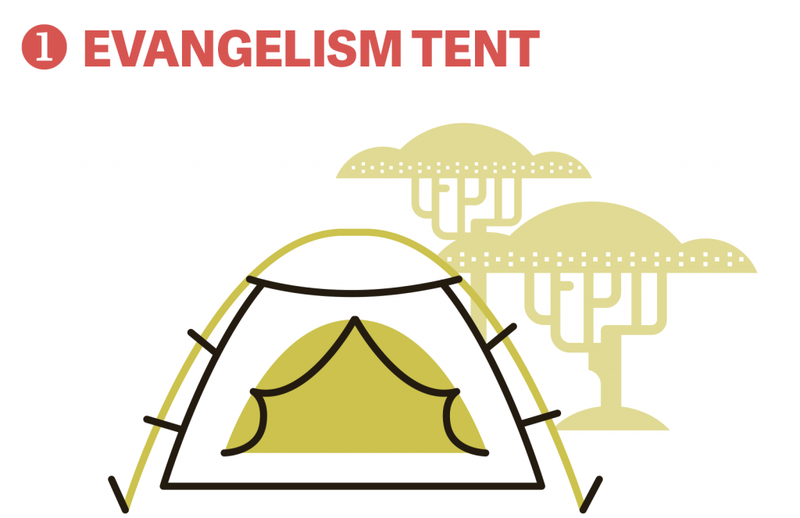 In this tent, MMT Chaplain Rev. Robert Pase, pastor of Grace Lutheran Church, Midland, Texas, and Faith Lutheran Church, Andrews, Texas, and local Lutheran evangelists presented the Gospel message in three languages: English, Swahili and the local Turkana language. “I know in Jesus if I don’t see you again on this earth, I will see you in heaven, with no need for translation,” Pase said to the people listening attentively at the end of one of his presentations. The patients then moved on to a second tent, where members of the MMT took their vital signs before sending them on to the nurses and doctors. Although the clinic was limited in the medications available and the diagnostic tests that could be performed on-site, the team was able to deliver physical relief to patients suffering from maladies like malaria, pneumonia, tuberculosis, mumps and scabies. They also were able to run tests and share the results with patients — from a joyful pregnancy announcement to tragic news about an HIV diagnosis. The final stop was the pharmacy, where patients picked up any medications they had been prescribed. Everyone left with something, even if it was just a package of vitamins or Ibuprofen tablets to ease the aches and pains of daily life. “Simple things, like getting somebody who clearly has allergies antihistamines, can make a big difference in the way they feel,” said Dr. Jeffrey Pruitt, a general surgeon and member of St. John Lutheran Church in Defiance, Ohio, who served as the team’s doctor. In just five days, the team treated 1,861 people, distributed boxes upon boxes of medications and gave out 2,000 toothbrushes. Nicole Boeder, a teacher and member of Trinity Lutheran Church, Springfield, Ill., teaches children how to brush their teeth. 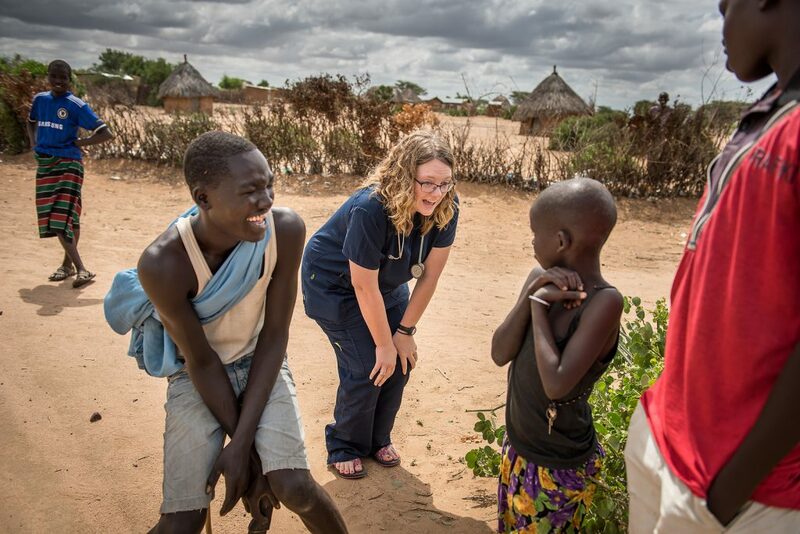 Sarah Kanoy, a nurse and career missionary in East Africa, sets up an IV for a young woman with low blood pressure. Dr. Jeffrey Pruitt (right), a member of St. John Lutheran Church in Defiance, Ohio, works with a Kenyan doctor to treat a young patient. The Rev. Robert Pase, pastor of Grace Lutheran Church, Midland, Texas, and Faith Lutheran Church, Andrews, Texas, shares the Gospel message with the assistance of a local Lutheran evangelist. Nicole Boeder tells children about Jesus during the June 21 clinic. Each American nurse or doctor was teamed up with a Kenyan counterpart, so that both parties could learn from each other. Not only did the Kenyan medical team help translate, but they also were more familiar with the illnesses and conditions commonly seen in the area. Pruitt commented that this collaboration is one of his favorite things about the two MMTs he’s experienced. It was the Kenyan doctor, he noted, who recognized one patient’s trachoma — a bacterial infection that can lead to blindness if untreated. Shane Lund, a firefighter paramedic and member of Faith Lutheran Church, Merritt Island, Fla., was assigned to run blood and urine tests in the clinic lab — tasks he rarely performs at his job. He was grateful that the lab technologist from the Lodwar hospital was there to walk him through the process and teach him how to tell patients the results in their own language. Watch and listen to Sarah Kanoy, a career missionary in East Africa, as she talks about the work of the MMT. The MMT also gave several team members who hope to work in the medical field one day some hands-on experience. Daniel Boeder, a second-year medical student and member of Trinity Lutheran Church in Springfield, Ill., found that practice really does make perfect. He said he’s not going to have any problem passing the vital signs portion of his med school exam next year after taking the blood pressures of 300-plus patients. “It was really interesting to see how the local Kenyan doctors did treatment there knowing that [the patients] were probably never going to go to a doctor again,” he said. There was a job for everyone on the team, not just the doctors and nurses. Lorrie Kirst, a city planner and member of Hope Lutheran Church in Manassas, Va., helped in the pharmacy, and Boeder’s wife, Nicole, a teacher and former missionary with the LCMS, gave out toothbrushes and toothpaste. The ELCK, a partner church of the LCMS, had specifically requested that the MMT come to serve in this remote place. The ELCK had been given some land in the area and dispatched the Rev. Daniel Mutai to establish a new mission station there. Watch and listen to the Rev. Daniel Mutai, a pastor from the ELCK who is working in Turkana. The MMT was an important step in that process. As the team cared for the old and young and played with the local children who gathered every day, the community took notice. Camels cross the road in the Turkana region. “People are questioning, ‘Why are these people coming to us with free medication?’” Mutai said. “They are talking positively. This will actually help me to open a congregation here in Lodwar because many people will know that there is a church called the Evangelical Lutheran Church. “We have been telling many that our mission … is to preach the Gospel of our Lord, Jesus Christ, to serve humanity spiritually and physically,” he continued. The LCMS and the ELCK have a plan in place so that people who heard the Gospel during the MMT can continue to learn about Jesus Christ and be brought into the new church that will soon be founded here. Photo Gallery: A day at the MMT in Turkana, Kenya. Lord Jesus, You are the Great Physician of both body and soul. We thank You for the work of medical mission teams throughout the world. May the work begun in Turkana, Kenya, flourish through the power of Your Spirit in Word and Sacraments, that all may know and receive full and eternal life in You, who live and reign with the Father and the Holy Spirit, one God, now and forever. Amen.